Kevin Dacey (’94) has biked from Houston to Austin three times to raise money for the National Multiple Sclerosis Society. He is planning to do so again April 16-17. When Kevin Dacey (’94) decided to bike 150 miles to Austin to raise money for multiple sclerosis (MS), he had never met anyone with the disease. 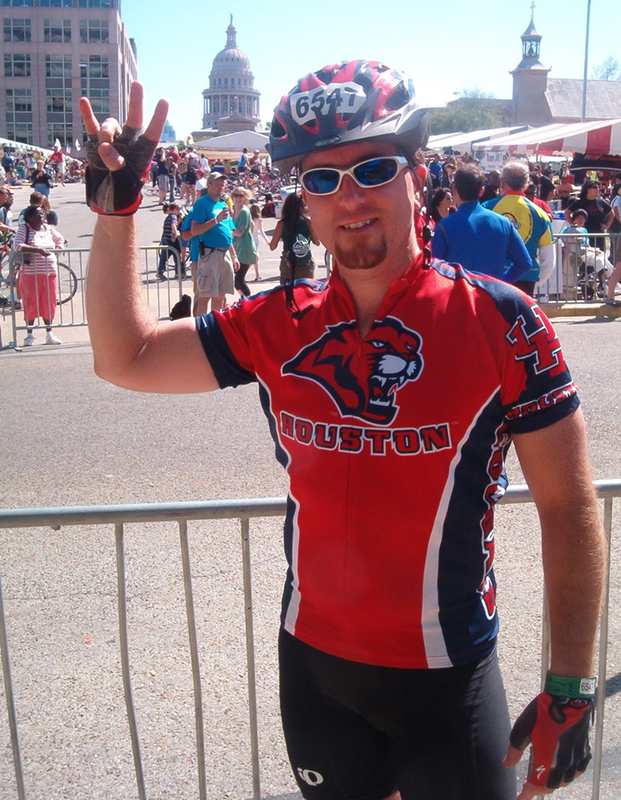 He just liked cycling with two of his old buddies from the University of Houston — Lee Mabry (’95) and Chuck Grenfell —and saw the BP MS 150 as a personal goal. Dacey — who studied management at University of Houston C. T. Bauer College of Business and is now a senior systems administrator at Grocers Supply Co. — learned the value of community service at UH. His fraternity, Sigma Alpha Mu, raised money for the Elizabeth Glaser Pediatric AIDS Foundation. But his friendship with Hardaway opened his heart. According to the National Multiple Sclerosis Society, the chronic, often disabling disease of the central nervous system affects approximately 400,000 Americans. Last year, 12,000 cyclists raised more than $16 million in the BP MS 150, sponsored by the Lone Star Chapter of the National MS Society. Since the first ride in 1985, the event has brought in more than $131 million for MS.
A Louisiana native, Dacey moved to Texas at 4 and grew up in Corpus Christi. While at UH, he marched in the drum line of the Spirit of Houston band for three years and worked as a valet parking attendant. 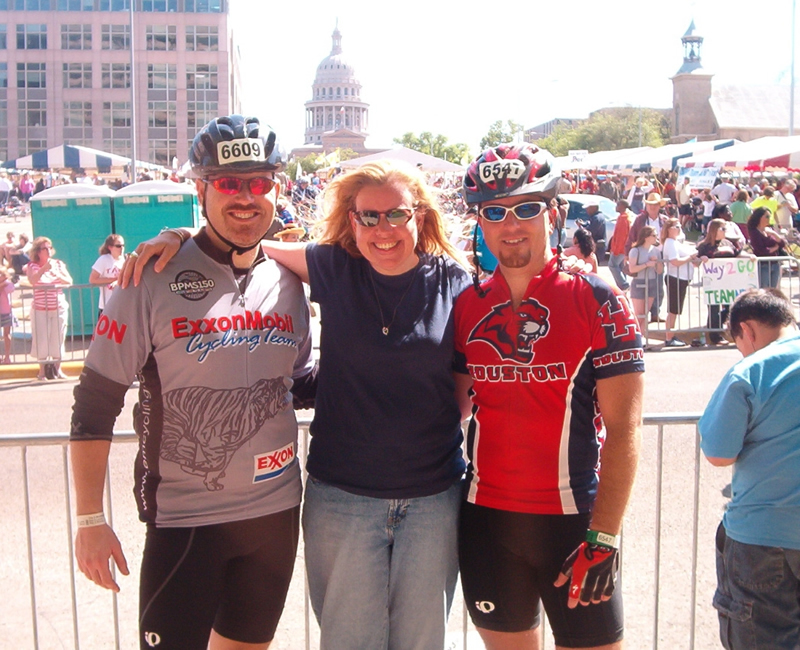 Kevin Dacey (’94, right) is shown with his friend and fellow biker Lee Mabry ('95) and Mabry’s friend Lea Ann Hardaway, shortly after the 2008 ride to Austin. Hardaway, who suffered from multiple sclerosis, passed away in 2009. Dacey and his friends dedicated their 2010 ride to Hardaway. To train for the overnight trek to Austin, Dacey will bike anywhere from 60 to 130 miles per week. This year, his dad will join the cadre of Coogs, and his mom will be at the finish line in front of the state Capitol. Dacey hopes to raise $1,000. 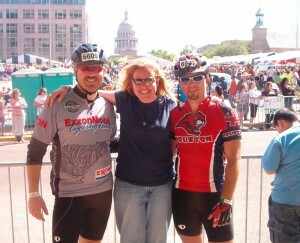 After the ride, he and his friends will celebrate with margaritas and Tex-Mex at Chuy’s. One of his best memories of the BP MS 150 has been the cheering along the way. “When you get into a little town out in Hill Country that has maybe has 2,000 people, and 500 or 600 of them are lined up on both sides of the street cheering you on, it’s really touching,” he says. To pledge for Kevin and his group, click here.